This Alberto 2 light pull switch wall light in antique brass finish, with linen shades and crystal drops features a circular mount and two upright crossover arms that form a teardrop shape in the centre, with oatmeal linen cylinder lamp shades and convenient pull cord switch. Finished with faceted hanging crystal glass buttons and drops. 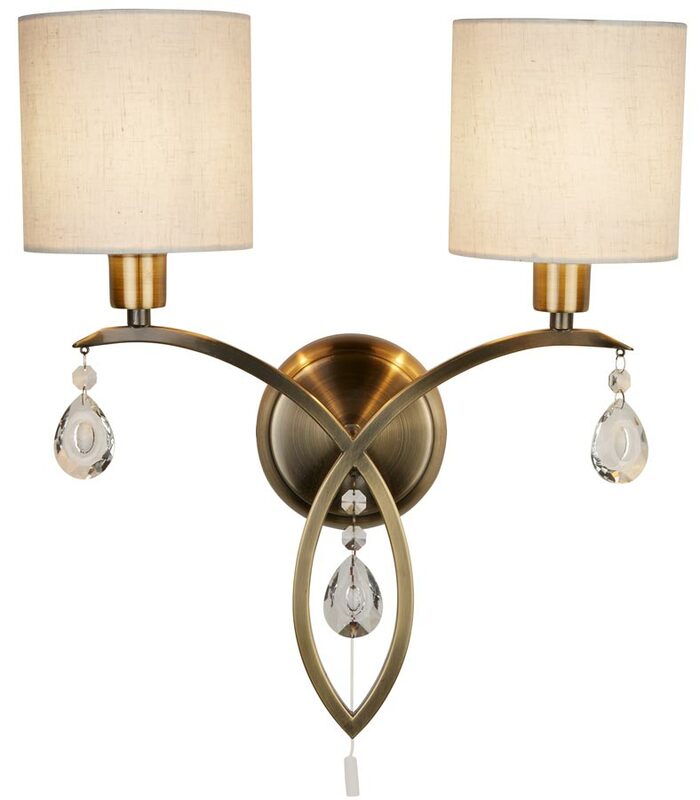 Bring style and opulence to your living room, bedroom or dining area with this beautiful wall light. Two lamps sit delicately inside oatmeal shades and the stunning curved design features cascading crystal detail to create an attractive additional lighting source for any room in your home and add a touch of glamour. There are matching fittings available in the Alberto antique brass finish lighting range that includes three, five and eight-light chandeliers; please see below. This wall light is supplied by Searchlight who manufacture some of the best traditional and modern classic designs such as the Alberto 2 light pull switch wall light in antique brass finish with linen shades and crystal drops you see here.